Need some great plants for your freshwater Aquarium? The right freshwater aquarium plants provide natural filtration for your fish tank’s water, help breed smaller fish and give your fish a home. Aquarium plants provide a nurturing environment for fish. They offer relaxation, safety, a healthy diet and a place for fish to breed. And they make your home look beautiful! 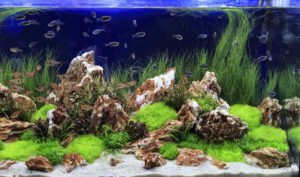 Veteran aquarium plant owners know that while many plants can withstand your fish tank’s fluctuating water temperatures and changing water chemistry. Some freshwater aquarium plants outlast others and provide better benefits for your fish. Not to worry, this post will give you the deets on which plants are best for your fish tank and why. Without further delay, here are eight freshwater aquarium plants that you and your fish will love. Have shrimp in your tank? The popular java moss is a favorite for shrimp. It gives them great places to hide and rest in peace. The java moss works best affixed to rocks and driftwood in your tank. Connect them easily with a rubber band or piece of string to help them to take root while they prop up the java moss. The java has a tendency to float around your tank, but appending it to one of these ornaments gives it better support and keeps it in place. The java moss flourishes in a low lighting. Make sure its light isn’t too powerful. Low lighting keeps it healthy and strong. Dimmed lighting is always best. If the light is too overpowering it prevents the Java moss’s growth. A bright light can also induce green algae, which is bad for your plants, your tank, and your fish. When checking water temperature, keep the water between 70 degrees and 90 degrees Fahrenheit to sustain its growth and between 70 and 75 degrees Fahrenheit if you want it to grow. Another shrimp favorite is the Java Fern. Which can be purchased for small and large sized fish tanks. This fern, similar to Java Moss thrives in a low light environment. The fern contains green stems which produce the leaves, called rhizomes. They become fine when attached to adjoined rocks, driftwood or other fish tank ornaments. Like the Java Moss, these freshwater aquarium plants make great hiding places for fish. For larger Java fern plants, tuck its roots beneath the rock. But take note: make sure you don’t bury the rhizomes. Java Ferns do best when water temperature is between 68 degrees and 82 degrees Fahrenheit. In the right environment, they grow easily and are a good plant for any beginner. When it’s time to propagate, these plants release spores from their leaves. These aquarium plants are inexpensive and don’t require fertilizer or plant substrates. These plants vary in shape, color, and size and branch out beautifully. They also require dim lighting. The Cryptocoryne requires a bit of maintenance, unlike the javas due to their multifaceted roots. Cover the roots two inches under the rock, keep the crown area where the leaves are above the rock. Take extreme care of these when you first put them into the aquarium as they can become vulnerable. Cryptocorynes grow best in water temperatures between 72 degrees and 82 degrees Fahrenheit. They require moderate lighting. This freshwater aquarium plant is great because it’s nice to look at and is easy to maintain. It needs low levels of nutrients and lighting to subsist. If you have many other plants, take heed with this plant. It grows fast and can grow up to 20 inches high, so that’s a good thing to keep in mind before you buy it. The Sword that actually looks like a sword comes at a cheap price. It requires direct lighting. Water temperature should be between 72 degrees and 82 degrees Fahrenheit to grow best. These are two plants, Anubias and Anubias Nana. They’re easy to keep and their growth is gradual. Never cover the bottom of the root under rocks or other ornaments. Keep it in the shady part of the tank to avoid growth of algae on its leaves. This plant grows well in nano aquariums, requires low nutrients, no fluid manures. It does well in water temperatures between 72 degrees and 78 degrees Fahrenheit and needs moderate light. Known by two names, these freshwater aquarium plants require little upkeep. It flourishes in water with low or high PH. The plant becomes full when in moderate lighting and sparse in lower lighting. Perfect for the novice because it can survive or various lighting environments, chemical environments and does well in a variety of water temperatures. The new buds emit a red color. The beautiful Pygmy Chain Sword is great to look at and easy to care for. Also called Bunch Plants, this species is another favorite for shrimp-aquarium enthusiasts. They offer plenty of places for shrimp to explore. They thrive in several conditions and require direct light. While the plant germinates, clip off a healthy lengthy stem and bury it in three to four inches of gravel. Wisterias flourish in water temperatures between 75 degrees and 80 degrees Fahrenheit. Their lace-like leaves make them a pleasing site inside or outside the tank. Also known as Coontail, these freshwater aquarium plants are adaptable to the tanks fluctuating conditions. They can grow to 24 inches long and can be planted in the substrate. These plants, often seen floating freely on the surface of the tank, survive in various water temperatures. Great for beginners! Now you know eight great plants for your freshwater aquarium! Ready to get started? Our company provides guides and reviews for your fish aquarium set up. Visit our website to learn more about aquarium setup and more.